As part of my aforementioned Summer TV Catchup 2k12, I'm going through Parks and Rec for the first time. After the far-too-The-Office-y first season, I gave up on it, but since nearly everyone who has stuck with it says it gets awesome, I have recently hopped on that train. No regrets. There are so many great characters in Parks and Rec, but one who is quickly becoming a favorite of mine is Ben Wyatt. Not only is he played by the same actor who played Griff in Boy Meets World (automatic express lane to my heart), but I find him charming and entertaining for multiple reasons. 1. He plays the straight man. - Every group needs someone who's a bit of a stick in the mud. Someone who brings it back to reality when no one else is thinking of the practical side. In this group that is especially the case. Leslie is passionate but sometimes gets her head stuck in the clouds. Ron is epically awesome but totally removed from day to day operations (by choice). Tom--I don't even know what his job is, but whatever it is, he doesn't really do it. Enter Ben Wyatt. 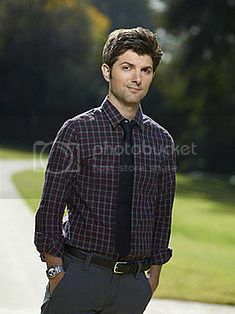 Number-crunching, skinny-tie wearing, One-F-Jef haircut Ben Wyatt. He comes off pretty solemn at first, but you soon realize he, like all the other characters on Parks and Rec, has a kind heart. And I kind of love him. It might be because I am also a slight stick in the mud. But I digress. 2. He brings an outsider's perspective. - The rest of the cast on Parks and Rec (except Chris of course) have been in Pawnee a long time. They don't really know life outside of it, which makes them hilarious, but oblivious to how ridiculous it is to anyone outside the town. Ben represents our point of view as strangers to Pawnee and can show us what it would be like if we worked in the parks department with these characters. For example, there is truly nothing special about Lil' Sebastian the mini horse, but everyone in the parks department and the entire town acts like Justin Bieber rode him into Pawnee five minutes ago or something. That was a bad example though because at what point would Justin Bieber ever mount any horse? Pretend I said some country star or something. Whoever that guy is who rapped with Ludacris last year. Pretend I said him. Anyway, Ben realizes this is complete nonsense, states so, and everyone else has a total record-scratch moment because Lil Sebastian is the greatest thing to ever happen to them. Can't have those moments without the outsider. 3. His friendship with Tom. - I'm only halfway through season 3, but so far I am ALL about this unlikely (but totally likely) friendship. With everyone else, Tom is the underdog in the relationship, even if he doesn't realize it. He's constantly vying for attention and trying to come off like a hip hop mogul or something. But with Ben he's established the upper hand since day one. If there's any type of person Tom thinks he's better than, it's a nerd. And to Tom, Ben is the ultimate nerd. (I mean nerd in the way that Zooey Dechanel is a "nerd." Not in the way that Napoleon Dynamite is a nerd. Totally different types of nerds here.) Tom acts like he's too cool for Ben, but he totally needs him. I mean, where would he be if Ben wasn't there to comfort him when Tommy Fresh got rejected by Dennis Feinstein? Anyone else might have just laughed in his face, but Ben took one for the team, choked back his vomit and sprayed Tommy Fresh all up in Dennis' car as revenge. Tom needs a rock like Ben to come back to, and Ben needs someone like Tom to get him to loosen up and have fun. Also to provide shelter and TiVo when he only brings a sleeping bag to camp with. It's the perfect symbiotic relationship.